How to Fix Error Code 80072F8F on Windows 8.1 Update? The solution is simple to Fix Error Code 80072F8F on Windows 8.1 Update! Please check the Date and Time on the Windows 8.1 and set the correct Date and time! ... how to change the windows 8 and 8.1 local date and time? (Image-1) Fix Error Code 80072F8F on Windows 8..1 Update! 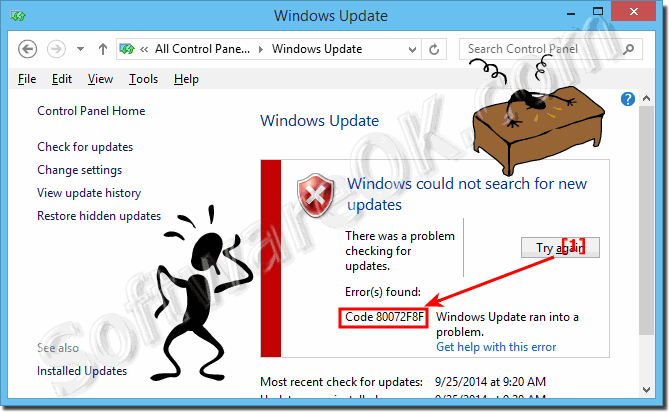 Windows-8 - FAQ-225: How to Fix Error Code 80072F8F on Windows 8.1 Update? How to auto run a program at a certain time in Windows 8.1 / 10? Can I disable Spell-Checking or Auto-Correction in Windows 8.1 and Win 10? How to find and open the Cookies folder in Windows 8.1/10? How to create a virtual hard disk on Windows 8, 8.1 and Win 10 (VHD)? Windows 7 update error code 80072f8f fix? 80072F8F windows update 8.1 ?